Tax revenues in Ireland have exceeded Government expectations for the 2010 year, with end-of-year total being reported at EUR 703 million above estimates. On January 5th the Department of Finance of Ireland released the 2011 Analysis of End Year Tax Receipts, which summarizes the country’s tax revenue results for the 2010 calendar year. The publication shows that over the period total tax revenues reached EUR 31.75 billion, approximately 2.3 percent (EUR 703 million) above the Government’s own revenue estimates. However, compared to the 2009 calendar year, collections for 2010 had dropped by 3.9 percent. Personal income tax collections were the largest contributors to annual tax revenues, reaching EUR 11.28 billion, 2.2 percent below official forecasts. Conversely, corporate income tax revenues were an unexpected 24.2 percent above estimates, reaching a total of EUR 3.9 billion. The level rose above that seen in 2009, by approximately 0.6 percent. While discussing the revenue figures on the day of the release of the report, the Minister for Finance Brian Lenihan attributed the growth in corporate tax revenues to an unanticipated recovery in the export sector. Excise tax and Capital Gains Tax were also revealed to have risen above expectation, by 3.6 percent and 2 percent respectively. Value Added Tax (VAT) revenues were in line with official predictions, reported at being only 0.1 percent above estimates, at a total level of EUR 10.1 billion. 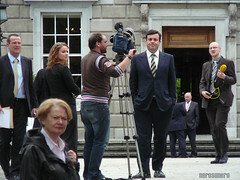 During the press conference Brian Lenihan commented on the overall results, saying, “…it is to be welcomed that three of our big four tax heads – VAT, excise duties and corporation tax – performed above expectations.” He added that the positive movements “are real grounds for optimism about the Irish economy.” The Minister also said that the weaknesses in the final tax receipt results developed early on in 2010, and had not grown throughout the year, adding further credence to the idea that the economy is stabilizing.